The word "Hades ("Hell" in the King James Version) in the Bible means, according to Webster, "The state or resting place of the dead. "1 Jesus died on the cross of Calvary (Luke 23:46) and entered the state of the dead. However, Peter affirmed in Acts 2:27ff that his soul was not left in that state. He was raised (Acts 2:32). Not even death itself could keep Jesus' soul nor prevent his building his church. A noted scholar of the language of the New Testament has remarked that the word "Church" (Greek - "ekklesia") [ekklesia] meant: "(a) An assembly of Christians gathered for worship. . . (b) A company of Christians. . . "2 in its Christian usage. 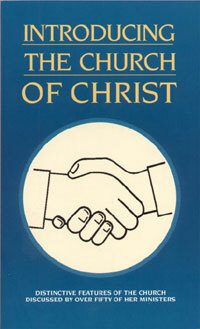 The word "church" refers to both a________of Christians gathered for worship or a _______of Christians.